This plaque comes on a faux cherry board and allows for 5-7 lines of engraving. 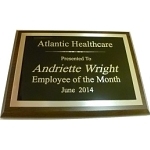 Plaque prices include an engraved plate and a trim plate on a faux cherry board. This plaque allows for 10-12 lines of engraving. This plaque allows for 12-14 lines of engraving and has enough space for a picture or logo. This plaque allows for 15-17 lines of engraving and has enough space for a picture or logo. Maximum of 30 characters per line.